Many anglers have experienced the frustration of approaching a stream, seeing fish holding in a feeding drift and then watching all of the trout dart about and vanish before the anglers have a chance to start fishing. The ability to see movement and detect vibrations are two of the primary senses that trout use to avoid anglers. Understanding how to reduce detection while approaching trout will definitely improve an angler’s chances for catching more fish. Let’s consider a few of the general observations that I have gathered from past fishing trips. 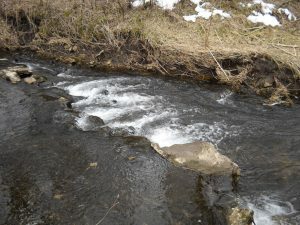 Trout usually feed in a forward-looking field and like to feed while facing up stream where a current brings them food. They will react to movement observed towards the front and sides but they have a blind spot towards their tail. Fish holding in shallow water react quickly to any movement along a stream while fish holding in deeper pools many not react to streamside movement. Loud noises, such as dropping a tackle box into the bottom of a canoe or stomping along the edge of a creek, will send fish seeking cover. An angler’s chances of seeing trout improve on bright days and especially when using polarized sunglasses. A trout is more likely to see an angler when there is more available light. It is often the flick of an ear or the twitch of a tail that allows deer hunters to locate a deer in heavy cover. Likewise, sudden movements, that attract attention, are often the nemesis of the trout angler. When approaching a stream or river, we need to keep our activity slow, keep a low profile and try to approach from downstream. Fishing during periods of lower light levels is like using a blind to hunt turkeys. You can increase the odds of catching more fish by fishing during early of late low light conditions, on cloudy days, or when the water surface is disrupted by a light rain or windy conditions — when low light conditions make it difficult for trout to see your presence. Suspended particles in a stream (muddy runoff or plant material) actually diffuse available light and will also decrease a trout’s ability to see. There are numerous technical articles online about what trout actually sees that may be of interest. My best advice to anglers remains: get out on the water and learn from experience. Practice, practice, practice!